Answer Digital team days are a small but important part of our culture. Read how we fared on our recent company away day to Via Ferrata in the Lake District. From the 1700s, Honister was home to a vast slate mining operation with men and horses traversing the crag to haul the prized materials down from the dizzying heights, surrounded by the natural beauty of the Lake District. Now that we have offices with comfortable chairs, computers and air conditioning, surely a large group of digital professionals can do the same? It’s 8am in the morning and we’re boarding the (brand new!) coach ready for our trip up north from Leeds to Honister Slate Mine. It was then that the major issue of the day arose... where are the cornish pasties?! They were supposed to be here 15 minutes ago! Add to that the weather forecast, predicting a typical English summer of clouds and rain and we’ve got a right old disaster on our hands. The crisis lasted a nerve-wracking 6 minutes. The smell of freshly cooked pastry and meat soon greeted my colleagues with delight and the coach driver, his brand new carpets on his mind, with trepidation and fear. That trepidation and fear was felt and visible in some of my colleagues as we arrived at Honister Slate Mine and got a first sight of what we were attempting to accomplish. After a quick lunch, headcount (seriously, have we lost someone?) and a safety demonstration, we started our ascent up (and through) the mountain. I was tasked with taking some photos and upon doing so, my first real act of the day was to immediately walk into and hit my head on the mine entrance you see just above. It’s been said that millennials spend too much time looking at their phones and not even time on where they’re going - fair point, I guess. After navigating the dark mine, water puddles and a surprisingly tiring upwards climb, we reached the starting line of the real work! That brave soul was Dave, one of Answer Digital’s newest and brightest recruits (pictured above). RIP Dave, gone but not forgotten. Of course I jest! I’m happy to report zero casualties, and the only injuries were a few minor hangovers the following day. The Via Ferrata (translating roughly as “Iron Way”) consisted of various ups and downs (literally and mentally) and side to sides made up of ladders, ridges, footholds and bridges all to reach the summit of Fleetwith Pike. And here’s the photographic proof. After the steep descent, we met up with our colleagues who opted for the more gruelling 4 hour, 760m ascent from Honister Pass to Great Gable. Rather them than me! A long deserved period of relaxation was in order, and this was accomplished with a lovely meal and a few local beers/not-so-local red wine at the Gate Inn in Yanwath. After being sufficiently fed and watered, it was time for the rainy drive back towards our Yorkshire home of Leeds - I’m pleased to announce that the rain held off until we were on the coach, despite the ever-present threat. Overall, I’d say that means a resounding success! At Answer Digital, two of our core values that help create our unique atmosphere are ‘Nurturation’ and ‘Put Love in the Room’. Our team days are a small but important part of our culture. 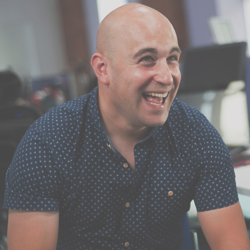 Matt is a Project Manager, who brings a wealth of knowledge within the retail sector. Prior to joining Answer, Matt had worked within project delivery for Morrisions helping to deliver digital improvements internally and throughout their 400+ stores. He is passionate about agile delivery of quality software that enable clients to meet their expected outcomes. If you’d like to know more about Answer Digital and our current opportunities, get in touch with us.